Donations to scholarship funds in the School of Languages, Cultures, and Race are an essential part of our resources in a time of shrinking state support for public higher education. Your generosity, however large or small, is deeply appreciated and helps us to attract the brightest students to our program while providing the most impactful learning experiences and support. For support of the American Studies Program. For full-time Chicano/a, Latino/a, and Hispanic students who are US citizens or permanent residents with superior academic standing and demonstrate leadership ability and potential for community and civic leadership. Apply through the Office of Student Financial Services by completing the WSU General Scholarship Application. For full-time undergraduate students of junior or senior standing majoring in the field of foreign languages. Scholarships will be awarded on the basis of financial need and academic achievement. For students who are studying foreign languages who are deserving and have financial need. For students studying foreign languages. For junior and senior standing students pursuing a foreign languages degree with a GPA in foreign language courses of 3.5 or higher and an overall GPA of 3.3 or higher, with a first preference for students studying French. For undergraduate and graduate students in foreign languages with a minimum 3.5 GPA. For undergraduate and graduate students in foreign languages. For foreign language students with financial need who are scholastically competent in German to attain excellence in the language, particularly in study abroad programs. For undergraduate study abroad students (foreign language major/minor not required). This scholarship is awarded by nomination of advisor or department chair. Apply through the Office of International Programs Study Abroad Scholarships. For full-time regularly enrolled students majoring in foreign languages with excellent character and with potential for growth in their profession. Show your support by contributing to the study of foreign languages and cultures and foreign language and cultures students at Washington State University. To provide essential enrichment for student and faculty research, scholarships, support for the quality of instruction, visiting lecturers, equipment, and other pressing needs of the school. Thank you to our generous donors for your continued support of our academic endeavors! 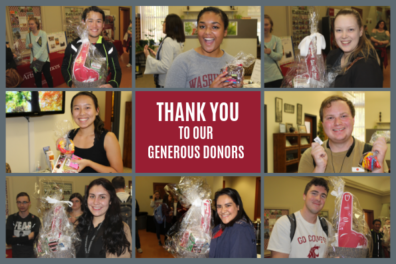 If you would like to find out how to become a donor or establish an endowment, please contact Don Shearer at hshearer@wsu.edu, or Tom Fitzgerald, at tfitz@wsu.edu.